The work of Düsseldorf-based artist Katharina Grosse presses against the confines of the painterly tradition. Engaging a range of surfaces, including aluminum, canvas, paper, and existing architectural elements, Grosse's site-specific abstract paintings are executed in a manner that emphasizes color over brushwork, movement over stasis, and impermanence over permanence. Hammer Projects are curated by James Elaine. Katharina Grosse was born in 1961. She studied at the Kunstakademie in Düsseldorf from 1982 to 1990. In 2000 she taught at the Kunsthochschule in Berlin-Weissensee. She has recently had solo exhibitions at Galerie Sfeir-Semler in Hamburg, Sarah Cottier Gallery in Sydney, and the Artsonje Museum in Kyongju, South Korea. In 1999 she was the artist in residence at the Chinati Foundation in Marfa, Texas. She lives and works in Düsseldorf and Berlin. This Hammer Project marks her first solo exhibition in Los Angeles. An encounter with one of Katharina Grosse’s vibrant abstract paintings can be exhilarating, soothing, mystifying, distressing, and often all of these things at once. For instance, a huge and hazy stain of dark green with blinding yellow edges, soaking the upper part of a wall and crossing over to the ceiling, hovers like an apparition above the viewer, simultaneously lifting one up and weighing one down. Or a big blot of deep red blurred by bluish and sallow mist makes an entire room seem to pulsate and bleed, evoking feelings of both safety and fear. Other projects make unconventional and risky alliances in terms of style. An enormous billboard in Auckland, New Zealand, which Grosse spray-painted during her recent residence there, fuses a calm and elusive Monet-like texture with the flashy, feverish rhythm of graffiti. Staging such color events, rife with contradictions, is Grosse’s forte, and the idiosyncratic imagination, exuberance, and audacity she brings to her medium has put her among the most interesting younger German painters today. 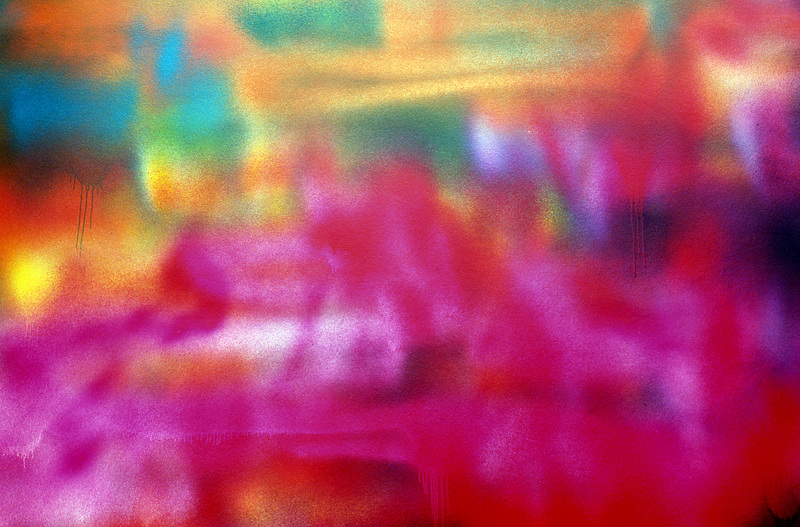 Grosse first started to attract attention in the mid-1990s with her unusual color-field paintings. The neatness, and perhaps rigidity, one might normally associate with the genre was undermined by her subtle use of offbeat, dirty mixtures as well as intentionally flawed brushwork. Enthusiastically experimenting with colors and brush strokes and exploring the psychological impact different combinations of tones and textures can have, Grosse soon moved to larger formats and exchanged the brush for a broom. Covering thick sheets of paper with individual colors (which were often the result of several layers of paint) and hanging them like curtains before the wall enabled her to improvise and to play with a sequence until a desired tonal arrangement was found. These painting installations had a way of filling the space like sound, spreading their often dissonant vibrations beyond the borders of the works and resonating in every part of the room. Grosse’s preference for invasive staining techniques and her striving for an unrestricted painting gesture eventually led her to the spray gun. Since then she has worked mostly on-site, applying paint directly to walls and ceilings, not sparing doors, passageways, and windows. In the increasingly expansive and eventful abstractions she has created over the last several years, linear boundaries have dissolved completely and color itself has become form, while the space serves as a sort of sponge to absorb it. For example, a big feast of orange and green seems to have been devoured by the corner of a room, leaving the viewer with only a faint blot; elsewhere a densely color-packed formation appears to keep mushrooming in front of one’s eyes. With her spray paintings Grosse has also come closest to what was always an important part of her work: the palpable presence of the process itself, material evidence of her interaction with the piece. Whether their presence is intentional or not, colors that penetrate and run into one another; shiny, foggy, or washed-out areas; and drips of excess paint bear witness to what has occurred. Since every one of Grosse’s paintings is a unique event that is influenced by the architectural, geographical, and social situation, each project is a discovery not only for the viewer but also for the artist herself. In Marfa, Texas, where she was invited by the Chinati Foundation, which encourages site-specific works, Grosse painted the interior of a low, freestanding building with a powerful high-contrast composition of mainly reds and greens. Although it was entirely abstract, one could see the piece as being inspired by the vast and tumultuous west Texas sky. Inside, the visitor would be enveloped by the painted weather, so to speak; looking through the windows from the street, however, felt like watching a thunderstorm trapped in a cage. 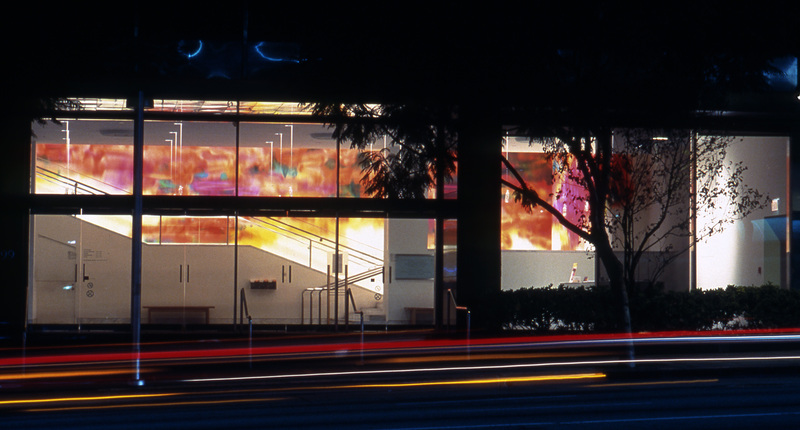 At night, when the building was illuminated, the work appeared particularly dramatic, even cinematic. Also, with the fast-moving clouds in the real background, the painting’s own impermanence as an image became all the more evident. This is a direction that Grosse has consciously taken. Most of her recent paintings are not meant to last, and there is nothing precious or monumental about them. They are temporary events, and as such they are much closer to contemporary pop culture than to traditional painting. Like movies, many of her works have a limited run. They will be painted over after being on view; they will vanish like graffiti or be removed to make room for the next billboard. Abstraction has a way of triggering a wealth of associations, and one is certainly free to read all sorts of things into Grosse’s works. A recent piece at the Artsonje Museum in Kyongju, South Korea, however, has a surprisingly pronounced narrative character. 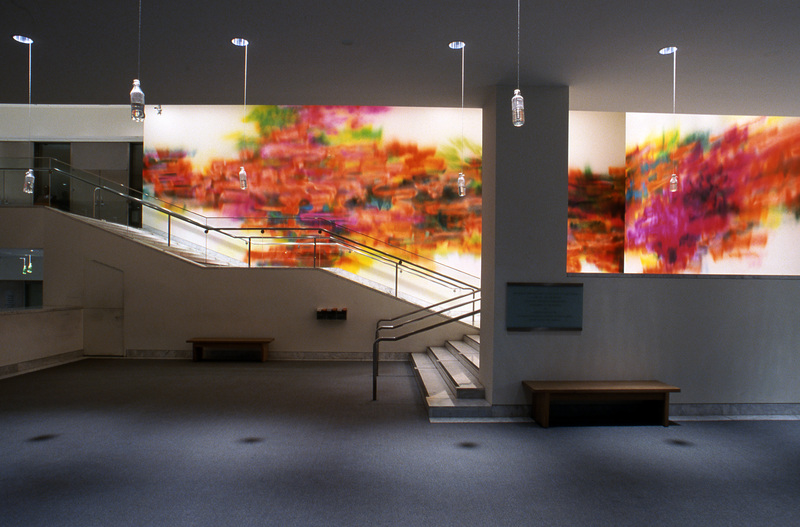 It’s an extremely dynamic, even turbulent, and very colorful work consisting of three parts, a kind of triptych scattered over the entire room. One main body of color originates in a wide corner and proliferates in all possible directions. It appears to be burning on one side, steaming on the other, imploding and exploding ceaselessly. You think volcano, jungle, hurricane; you think micro, macro, and creation itself. The second part of this universal organism suggests decay, destruction, even violence: a spray-painted, excrement-colored mass reaches into a succession of what look like knife cuts, a long row of vertical pink wounds painted by brush. As if to complete the cycle, the third, seemingly neutral component–a watery turquoise entity–sits slightly apart, like a breath or a pause, but ready to mediate between productive and destructive forces. While this unorthodox triptych renders the creative process itself, the act of doing and undoing that the artist is deeply involved in, it is also a good example of the larger perspective informing all of Grosse’s work. She has found her own singular way to translate the rhythm and spirit of our times not into an image, but into color, texture, and shape. Her paintings are just as contradictory and beautiful as our multilayered, fast-paced, information-packed, precarious reality. In all their complexity Grosse’s works are emphatically physical and emphatically spiritual at the same time. Sabine Russ is a German writer and curator based in New York City. Hammer Projects are made possible by The Horace W. Goldsmith Foundation and The Andy Warhol Foundation for the Visual Arts. Additional support is provided by the Los Angeles County Arts Commission and Peter Norton Family Foundation. This exhibition has received additional assistance from The Goethe-Institut Los Angeles.